The Gray Campbell Distinguised Service Award for outstanding service to the publishing and writing community of British Columbia was established in 2000 to honour Gray Campbell, one of the first two trade publishers of British Columbia in the modern era (the other being Art Downs). "This singular honour means more to me than the money we never made!" Campbell said. Gray's Publishing Ltd. of Sidney published 61 titles between 1962 and 1982. It was established by Gray Campbell, born on Februrary 4, 1912, in Ottawa. He served in the RCMP (1932-1939) and the RCAF (1939-1945) before turning to cattle ranching for 12 years in the Alberta foothills. He published a memoir about his ranching life, We Found Peace, in 1953. He was greatly assisted in his ranching and publishing business by his war bride Eleanor Russell (Benson) Campbell, his partner for "59 glorious years". They moved to the West Coast for health reasons, after which Gray Campbell only entered publishing because a blind war veteran named John Windsor was unable to get his memoir accepted by eastern Canadian publishing houses. Gray Campbell published Windsor's "Blind Date" using a down payment of $250 won in a CBC-TV show called Live A Borrowed Life, forerunner to Front Page Challenge. His office was established in a converted chicken coop behind his house in Sidney. The company's second title was a silly, comic memoir by Hazel O'Neail, "Doukhobor Daze", that did little to engender respect for the much misunderstood and persecuted Doukhobors at the time. 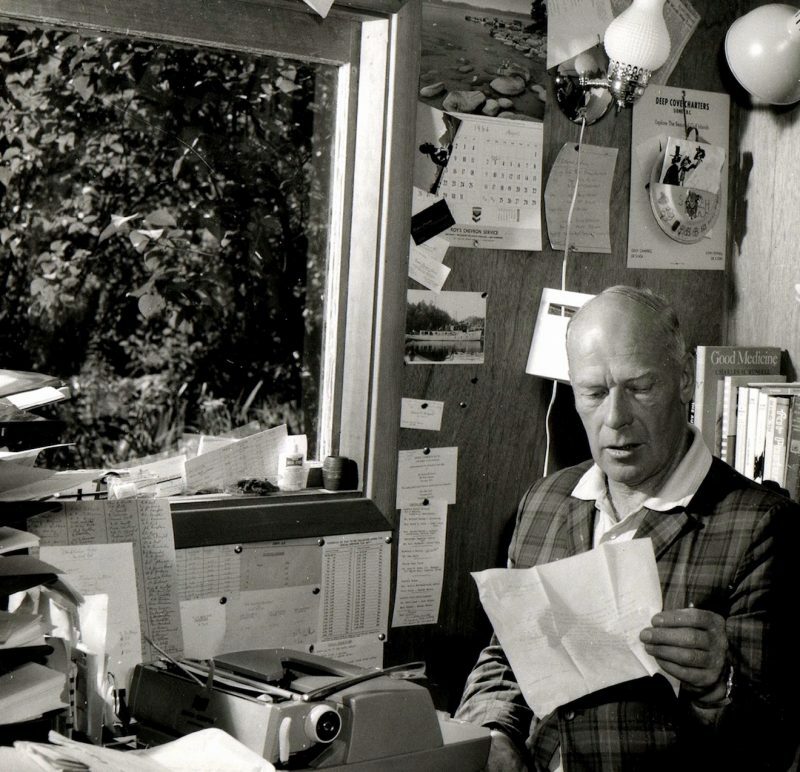 In 1964, Campbell published his first bestseller, The Pacific Gardener. One of Campbell's most significant publications was George Clutesi's Son of Raven, Son of Deer. When Campbell heard about a Port Alberni painter and storyteller named George Clutesi, he went to the Port Alberni Indian Reserve and found the artist fixing his roof. Shy and wary of white men, Clutesi wouldn't come down. Campbell climbed up the ladder and had a long talk. Almost a year later, George Clutesi phoned from the Vancouver Airport to say he was still thinking over what Campbell had said. George Clutesi's Son of Raven, Son of Deer was published in 1967. Clutesi's first book, which was extensively edited, remains in print as the first significant West Coast title about Aboriginal culture to be authored by an Indian. It was followed by George Clutesi's Potlatch (Gray's, 1969, 1971, 1973). Gray Campbell also published a collection of stories gathered from Aboriginal elders for children called Tales from the Longhouse (Gray's, 1973) for the B.C. Indian Arts Society. --R.M. Patterson's "Dangerous River" 1966, 1969, 1972, 1980. In 1983, Gray Campbell sold his company to Gordon Cooper, who retained the name Gray's Publishing. The company went out of business in 1984. In his retirement, Gray Campbell co-authored Yukon Memories: A Mountie's Story (Whitecap, $12.95) with Jack 'Tich' Watson and a parish history called St. Andrew's Parish of Sidney (Sidney: St Andrew's Anglican Church, 1996) with Marcia LeClair. His own self-effacing memoir was Butter Side Up (Horsdal & Schubart), published by Marlyn Horsdal, one of his former employees. Rich Mole, author of Dirty Thirties Desperadoes (2011), has added: "Gray was unusual in many ways, and his uniqueness came early: he was very much a high school athlete, yet by his late teens had a real love of classical music. He witnessed history as a 17 year old high school grad. In Oct., 1929, Campbell became a "board boy", chalking stock prices changes on blackboards in the customer room of an Ottawa brokerage house. He'd only been on the job three weeks (and hating it), when "Black Thursday" occurred--the beginning of the stock market crash. He reluctantly joined some friends in the Canadian Militia. Brokerage house client (and future author), T. Morris Longstreth, advised him to join the RCMP. He did--and loved it. "Posted to Edmonton as a raw recruit, he was one of a 22-man mounted riot squad which, he maintained, prevented a full-scale riot during the 1932 Hunger March, when the RCMP and a small contingent of city police faced off against an estimated crowd of 10,000, without loss of life. He and other squad members were briefly moved to Calgary, then, to his abject disappoint (he craved Canada's "final frontier," the far north) was posted to isolated little Banff, "where nothing ever happens," as he put it. How wrong he was! "In the fall of 1935, three Saskatchewan farm-boys of Doukhobor descent went on a robbery and murder spree, which took them from Bonito, Man, to the east gate of Banff National Park. Campbell was fated to witness history again--although, it's "forgotten" history. He was one of 4 officers who stopped the bandit-killers (the kids had already shot and stabbed 2 constables to death in Manitoba.) Within minutes, he was driving two fatally wounded fellow Banff Mounties to hospital in Canmore. "Decades later, he wrote that nothing "approached the nightmare I endured October 7, 1935, when I stood silhouetted in the headlights, a clear target for the revolvers of three murderers." That was certainly saying something, as he piloted Lancasters in 32 hair-raising bombing raids over Germany during WW II." [Alan Twigg / BCBW 2011] "Biography" "Publishing" "First Nations"
While attending the inauguration of the Gray Campbell Distinguished Service Award, Gray Campbell shared some of his memories with 100 West Coast writers and publishing personnel who are following his footsteps up the ladder. "It had started innocently. We encouraged a blind war veteran named John Windsor to write about his struggle to recover from a tragic tank battle in Italy. When two eastern publishers turned it down, John hit rock bottom and we had to do something. Eleanor and I discussed the possibility of publishing it ourselves. When we went looking for advice and help, the reaction was negative. Bill Duthie offered to send the manuscript to his old friend at Macmillan but when I told him we were already setting type in Sidney, Bill said he would do all he could to help, as did Jim Douglas. We found that Sainty Rivers, the publisher of the weekly Review in Sidney, had an unused flat-bed press that printed four-up, and a spare typesetting machine. But first we analysed the manuscript and asked why it had failed. We moved chapters around, using flashbacks, and the story came alive. "The first three books were printed on that old press. They did so well, Charlie Morriss and Colonist Printers in Victoria, and Glen Hyatt at Evergreen Press in Vancouver, all wanted to do a book with us. We started scrambling to keep them happy. Everyone in the media went out of their way to help. Peter Murray at the Times, John Shaw at the Colonist, Ida Clarkson at Chek-TV, Jack Webster on radio. They all pitched in. Two of our sons hit the road by Greyhound bus and our van to get the books into the stores. I hustled around Victoria and kept running into Margaret Reynolds who now runs the BC Publishers Association. My problem was to sell enough books to pay the printers, then the authors, and finally ourselves. My friend and neighbour R.M. Patterson, who had been published in London and New York, brought us a manuscript in 1963. That's when we had to produce our first contract. In 1974, after 12 years as B.C. 's firs; full-time book publisher, Gray Campbell of Saanich sold Gray's Publishing. He said it was time to retire. Campbell, a co-founder of the Association of Book Publishers of B. C., had produced approximately 50 titles from his backyard offices most notably the coastal cruising classic The Curve of Time by M. Wylie Blanchet (a memoir for which Campbell supplied a new introduction in a revised 30th anniversary edition now available from Whitecap Books). At 79, the indomitable Gray Campbell has become president of a new publishing venture, Porthole Press, working in tandem with sf author Michael Coney; Porthole most recently published a large format, limited edition of Snowbirds (1990), a tribute to Canada's most famous fling team. Porthole's other titles are Forest Ranger, Ahoy by Michael Coney (1983); Lost in the Woods: Child Survival by Colleen Politano (1984); Forest Adventure by Gray Campbell (1985) and Flynns Cove by Bethine Flynn (1986). Like so many B.C. publishers, Campbell originally entered the publishing field as a writer. 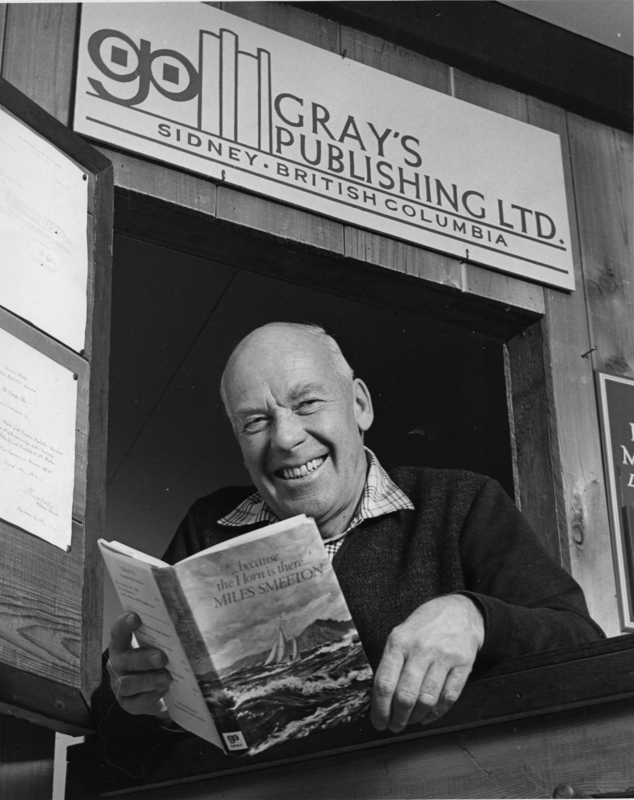 Gray Campbell's reflections on the early days of professional book publishing in British Columbia were recorded by Charles Lillard. WHEN I CAME OUT OF THE WAR I'D been flying Lancs. My wife said to me, 'I don't want you to wear a uniform anymore.' So we went cattle ranching for 12 years in southern Alberta. It was a big ranch and neither of us had known anything about cattle, but we succeeded. The government wanted to write it up since we'd achieved something. They wanted a government magazine article to glorify the government land act. My wife, being smart, said to me, 'If there's a. story there, you write it.' I wrote the article before they came out to interview me and I sold it to Macleans. Then Macleans changed the title. I'd called it We Found Peace but it was changed to Happy Landing at Squaw Butte. I was annoyed by that. So I sat down and wrote We Found Peace as a book. It was picked up in Toronto by Thomas Allen in 1953. Because I'd sold that book I thought it would be easy to live the rest of the way with writing. "For reasons of health, we sold the ranch and came out to the Coast with our four young children. I started writing articles and another book, a sequel to We Found Peace, but it never got off the ground. In those days, to keep the kids active, we got a little sailboat and rented a house at Curtis Point. That's where we met Capi (M. Wylie) Blanchet. Unknown to us at the time, our boat happened to be moored next to her Caprice. "Then in 1962 I started helping John Windsor write his book, Blind Date. "When he got it finished I sent it to Toronto, and it came back. They said it was a good little story, but they couldn't sell 10,000 copies at $3 a piece. John then sent it to somebody else, and it came right back with a rejection slip. So I got a little bit mad and I went into the local (Sidney) Review office, which was then run by Clair Rivers whom r d known when he worked for the Lethbridge Herald. "Let's sit down for a minute,' he said, and we got pencils out and started to work. 'How many do you want to print?' 'Three or four thousand copies,' I guessed. We can do it on the little press at the Review.' And I said okay. Friends in Banff said they would do the illustrations. So that's how Gray's Publishing got started. "Around this time I went on the TV programme Live a Borrowed Life with Victoria's historian, James Nesbitt, and won $250. With that money I went to Jim Wakefield, the printer at the Review, and said, 'How much does it take to get this thing started?' 'How much have you got?' he said. I said, '$250' and Wakefield said, 'That's exactly how much we need: "Then I went over to see Bill Duthie. I'd known him when he was a travelling sales rep for Macmillan in those days they travelled by train with trunks of books, and took a sample room in a hotel and invited in the librarians and bookstore owners. Bill had started his bookstore by this time. "I'm going to publish this fellow Windsor's book,' I said. Windsor had been in the tanks and so had Bill. Bill said, 'Don't do that. I'll send it to Macmillan: 'It's too late, I've already got it started: Well,' said Bill, 'okay, if you've made that mistake I'll help you when I can: "How do I get a book out?' I asked. 'Don't bring it out except at Christmas or Easter. Bring it out about July or August to hit the Christmas trade and get reviews by September: He gave me the whole drill. "I learned more about book publishing through Bill's kindness. 'Don't be like Howard Mitchell,' Bill said, 'He brought out a dandy book about four days before Christmas. By then it's too late: In those days Mitchell had a printing outfit in Vancouver and he was just about the only one who was doing regional publishing in B.C. He used to do one or two hardcovers a year when his press wasn't busy. He was really a printer. 'We weren't do-gooders, but you could see the market. And I still had this awful burn about Toronto. Why should everybody who wants to be somebody have to go to Toronto like Pierre Berton? That's why we wanted to get established out here, to attract western writers and give them a hearing. "In those early days my son rode the bus across B.C. and jumped off at each stop and sold books. He'd phone from some place like Nelson to say he'd run out of books so I'd mail him express them some. He went all the way to Calgary and back. It was quite fun. Then I filled our car with books and went up and down the Island. We drove into the Cariboo, too. If there wasn't a book store, we went to the drugstore. "; "I can remember when I started that there was an old Scotsman in Vancouver; he was there long before Bill Duthie. He wouldn't see me. He was in the back office and he said, 'Who is it?' And I said, 'A publisher from Sidney.' 'No,' he said, 'we only buy books from Toronto.' Afterwards we became good friends and he bought everything we published. But the initial reaction was that if it didn't come from Toronto, it isn't any good. There was also a little lady down on Douglas Street in Victoria she's been gone a long time. And Molly Charles was at Eaton's. But I didn't get a large reaction there. Cornish had a little store here in Sidney. And there was Jim Munro; he and I started about the same time. "Pretty soon I started getting letters from some ladies up in Ladysmith who had been school teachers. One of them kept saying I must look up this 'George Clutesi'. He's telling us these wonderful stories about the legends of Indian ways.' 'We were going out to Tofino a lot, so one time going by Sproat Lake I dropped in to see George Clutesi. He was a disappointed man and he had his back up; he'd been rudely turned down in Toronto, I think. He was up on his roof and he didn't want to talk to me. So I had to climb up and sit beside him. I told him what I'd done, and he said, 'Well, I'll think about it.' I went home figuring it was a dead loss. demand note for $7000 to get Far Pastures printed. That would have lost us the house we'd just bought and our car. Fortunately we sold that book on Patterson's reputation in about four months, which paid off the printers. It made me look very good to Evergreen Press. I couldn't make any mistakes. "Later Patterson asked me if I'd consider reprinting his book Dangerous River (George Allen and Unwin Ltd., 1954), that had been published in New York and London. He'd been told by his publishers that Dangerous River had gone all over the world, and they didn't think there was a future market for it. I disagreed. He got clearance so Gray's went ahead, but his New York publisher said they'd retain the right to bring out a deluxe edition. That's how I got into Charlie Morriss's hands. In 1966 Morriss Printing in Victoria published a beautiful, deluxe edition of our own that New York couldn't better. "We had to have a contract with Patterson. He lent us some of his English and New York contracts and I took them to Louis Lindholm, and he gave us our own contract, which we applied back to the authors we started with. "When I started I didn't know anything about bookkeeping. I kept track of our books with a running inventory on a piece of cardboard. When we had a profit, we gave John Windsor half until we got a system going."